San Diego Balboa Park is the famous cultural park of the San Diego area, featuring 15 + major museums, beautiful gardens, renowned performing arts venues and the San Diego Zoo. Balboa Park is the favorite place for locals to take their out-of-town guests, because it is such a special place. Your San Diego vacation should include a day at Balboa Park. 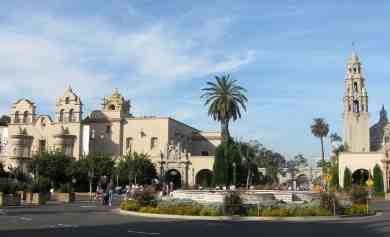 Balboa Park San Diego provides a great opportunity to explore the rich culture of San Diego. Explore museums, marvel at gardens and enjoys shows all day- or longer. 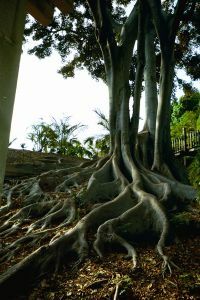 There is always something new to see at San Diego Balboa Park! Operating Hours: The park is all day (24 hours a day every day), though the Visitor’s Center is only open from 9:30 a.m. to 4:30 p.m. daily. The museum hours vary. Things to Do - Visit the Balboa Park Museums, visit the San Diego Zoo, explore the fantastic architecture of the old buildings, see a play at the Old Globe theatre, watch an IMAX movie at Reuben Fleet Science Center, take a California Tower tour, visit the gardens and hiking trails, enjoy an outdoor concert, participate in a race or other Balboa Park events. Food: There are a few restaurants inside Balboa Park, most of them located within the museums. On of the best in The Prado at Balboa Park, an award-winning full-service restaurant located in the House of Hospitality. 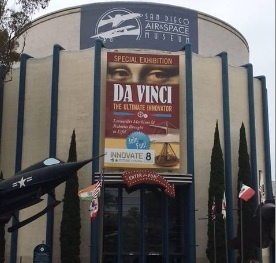 Museums - There are 15 museums at Balboa Park, each a unique experience. Ranging from science museums, such as the Reuben H. Fleet Science Center, to art museums, such as the San Diego Museum of Art. Check out our page on the Balboa Park Museums for more information. 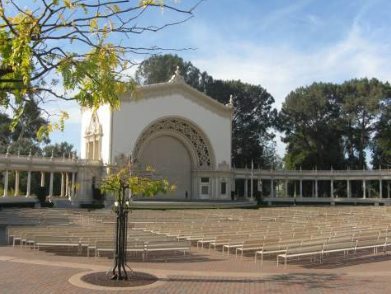 Free Organ Concerts in Balboa Park - Every Sunday from 2 - 3 PM you can enjoy a free organ concert at Spreckel's Pavillion in Balboa Park. Located at 1549 El Prado #110, San Diego CA. For more information call their phone number (619) 702-8138. 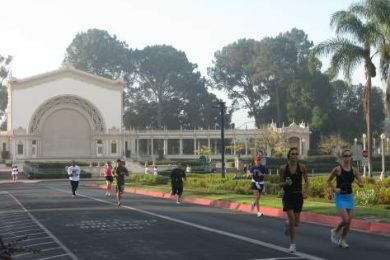 There are many free San Diego events in Balboa Park. During the summer, there are popular free concerts at the Sprekels Organ Pavillion. International Organ Festival - Held Monday evenings at 7:30 pm the outdoor Sprekels Organ Pavillion. Majestic sounds from the world's largest outdoor organ played by world famous organists. Other special nights include silent movies and jazz in the evening at Balboa Park San Diego CA. The grounds at Balboa Park are lovely all year around. Here are some Balboa Park photos. This beautiful tree is located near the Natural History Museum at Balboa Park. 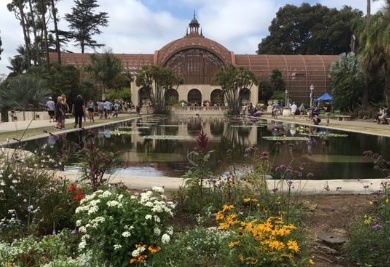 The Botanical Building, with its reflection showing in a relaxing pool, is a popular photographic site in San Diego's Balboa Park. If you like to explore the outdoors, we enjoy the shady San Diego hiking trail in Balboa Park, called the Palm Canyon trail. Directions to Balboa Park San Diego Cal. - From southbound interstate 5 in San Diego, take the 10th Avenue Exit off I-5. Turn left on "A" Street and left again on Park Blvd. Follow the signs to Balboa Park. Click on the link above to open the Google Map for Balboa Park San Diego and other attractions in San Diego and southern California.